If you would like to become a member of our award-winning team, call our dedicated recruitment enquiry line on: 0844 332 0599. We look forward to welcoming you and your family to Cherry Wood Grange Care Home – contact us today for more information on 01245 764 997. Cherry Wood Grange is a beautiful new care home which opened in Autumn 2017 in the heart of Chelmsford city centre. Those who choose to make Cherry Wood Grange Care Home their home benefit from high quality residential, nursing and dementia care, focused on improving wellbeing and overall quality of life. Being in the centre of Chelmsford means residents are able to be part of their community, maintaining independence, local experience and connections, whilst enjoying an exquisite and elegant home with many beautiful features and outstanding facilities. Our company has a reputation for delivering exceptional care, which many families have benefited from for over 20 years. 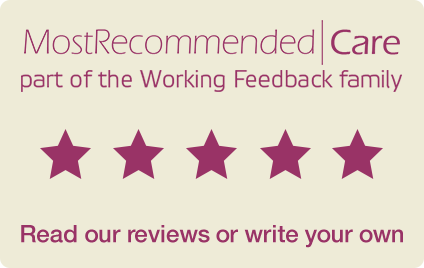 We have won over 20 industry care accolades, including the East of England 2016 Care Team Award and have an average rating of 9.5/10 on carehome.co.uk, an online portal that rates and reviews care homes in the UK. Reassurance that you are being cared for by a trusted and reputable provider, with care and compassion at the forefront of all we do. Residents at Cherry Wood Grange Care Home benefit from exceptional care that is highly personalised to an individual’s needs. Holding registration for all three levels of care will mean our residents should never find themselves in a situation where we are unable to care for them should their needs change – peace of mind for everyone. Find out more about our exceptional home and its facilities. We invest in our teams to ensure they provide the high standards of care that our residents and their families should expect. From our approach to recruitment and focus on retention of staff, we ensure our teams receive the right training, professional development and support to be the best they can be. We recognise and celebrate the contribution our teams make to our residents lives each and every day. Our residents enjoy a lifestyle that meets their individual social needs and preferences. From a comprehensive range of lifestyle activities in the home to maintaining relationships and links with the local community, to opening up the home to our families and community for events and celebrations – we want Cherry Wood Grange to feel like home for the whole family.